Muddy Waters was born McKinley Morganfield on 4 April, 1913, in Issaquena, Mississippi. As a child he was given the nickname "Muddy." In 1941, Alan Lomax and John Work travelled around the Mississippi delta, recording local bluesmen. One of these was Muddy Waters. Further recordings were made for Lomax, as well as radio appearances, and in 1947 he obtained a recording contract with Chess. Muddy Waters learned "Got My Mojo Working" from Ann Cole, who sang it as part of her warm-up act at Muddy's concerts during a tour of the southern states of America in November 1956. Cole recorded her version on 27 January 1957 (Baton 237), but Waters beat her to the studio, making the original recording on 1 December 1956 (Chess 1652). 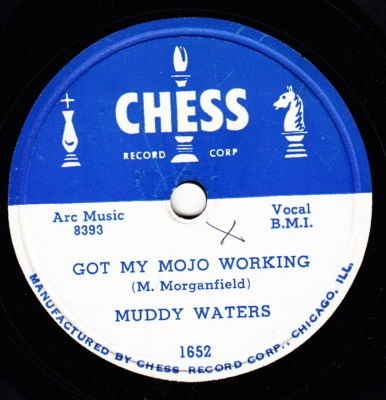 Muddy's version had the benefit of better distribution and so became the bigger hit. Others identify far older numbers as the original, including for example, Coot Grant and Kid Wilson's 1932 "Keep Your Hands Off My Mojo" and Leadbelly's "Keep your Hands Off Her" (along with numerous other candidates, too many to list). None of these, however, match in tune or lyrics the song that Elvis sang, even if the sentiment might be similar. Both this number and "Keep Your Hands Off Of It" seem to come from the same root, the one developing more in the Country area (Hands), the other (Mojo) in the R&B area.